KIEV, Ukraine -- Orthodox Christians celebrate Christmas on Jan. 7. So in Ukraine’s capital city, the holiday season is still in full swing. Shoppers crowd an outdoor Christmas market in Kiev. The festivities in Kiev leading up to Thursday reflect the continuance of normal life despite the frozen conflict in eastern Ukraine and looming battles on the nation’s domestic political front. At the Gulliver shopping mall, children line up to take pictures with Santa Claus (called Father Frost in Ukraine). Christmas lights are strung across Khreshchatyk, Kiev’s central boulevard. A huge Christmas tree dominates the square outside St. Sophia’s Cathedral. An outdoor stage showcases rock bands playing songs like Daft Punk’s “Get Lucky” as crowds of young and old revelers dance and sing along while sipping glintvein, a mulled wine. The temperature often drops more than 20 degrees below Celsius (-4 Fahrenheit) at night. A layer of snow covers the ground. The days are short and dimly illuminated. On Kiev’s streets, millennials wear hipsterish trench coats to stay warm. Young women wear UGG boots over their jeans. The older generations wear fur coats and ushanka trooper hats—the epitome of Soviet style in the eyes of many Americans. And a festive few brave the cold in Santa hats. 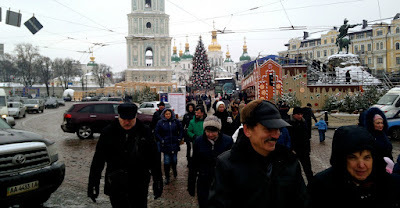 Kiev has all the distractions of a typical European city during the holidays. Yet the front lines in the Donbass are only a one-day car ride away. There, Ukrainian and combined Russian separatist soldiers hunker down in destroyed towns and battle-scarred trenches. A fragile truce largely holds throughout the separatist territories on Ukraine’s southeastern border with Russia. The pace and intensity of fighting significantly dropped after a cease-fire went into effect in September. It’s mostly small arms potshots, but artillery occasionally is used. The war is a shadow of what it was during the fiercest battles, such as in Debaltseve in February 2015 or in Ilovaisk in August 2014. But Ukrainian and combined Russian-separatist soldiers remain on the front lines, ready to kill each other. And there is still the worry, although it is slowly fading, that the fighting could reignite. Viktor Kovalenko, a Ukrainian army veteran of the battles of Debaltseve and Ilovaisk, two of the deadliest battles in the war, shrugged his shoulders. “I have no idea,” he said when asked if he thought the war slowly was tapering to a conclusion or if it would get worse again. “Nobody knows what Putin wants,” he said of Russia’s president. Mikael Skillt, a Swedish sniper who fought with the Ukrainian National Guard Azov Battalion in the battles for Ilovaisk and Mariupol, said the worst probably is over. “With Russia fighting in Syria, the separatists know they have to make peace,” he said. If you took the average civilian and brought them out to the front lines right now, they would be absolutely terrified. They’d think they had been dropped into World War III. But this is the best the soldiers have seen since the war began. Most people have no idea what it was like in the really bad days, and how close it came to disaster. One or two mistakes and it could be like that again. Reflecting the ongoing potential for violence, a Ukrainian government spokesman had some news at a press briefing Wednesday. Over the previous 24 hours, Col. Andriy Lysenko said, combined Russian separatist forces had attacked Ukrainian positions with machine guns, small arms, anti-tank mounted grenade launchers, and mortars. Many Ukrainian veterans from the war in the Donbass are coming to terms with their combat experiences, which have left them feeling out of place in normal life. Their enjoyment of the holidays is tempered by the knowledge that they have comrades still in foxholes and in trenches, enduring the winter snow and cold while exposed to sniper and artillery fire. Volunteer organizations in Kiev and other major Ukrainian cities offer free mental health counseling for returning soldiers. During the Soviet era, authorities used psychiatric care as a form of punishment. Consequently, lingering stereotypes in Ukraine prevent some from seeking treatment for conditions such as post-traumatic stress disorder (PTSD) and depression. Many Ukrainians are beginning to look beyond the war, not only because of the lull in fighting, but also because of recent diplomatic wins such as a free-trade deal with the European Union that went into effect Jan. 1. The greatest challenge for Ukraine’s post-revolution democracy, therefore, has shifted from the war in the Donbass against combined Russian separatist forces to the one in the Verkhovna Rada (Ukraine’s parliament) against corruption. The promise of the 2014 revolution now hinges on rooting out a corrupt oligarchic system entrenched for decades, which stalled the post-Soviet country’s transition to democracy and its economic integration into Europe. Ukraine cannot afford for the people to lose hope again. The only thing worse than having no hope at all is having hopes rise and see them dashed repeatedly on the shoals of corruption. And if the people resign themselves to exploitation and corruption for fear of losing whatever little they have left, that would be the death knell for Ukrainian democracy. Even though the war in the Donbass has tapered and the threat of a full-blown Russian invasion or civil war seems increasingly unlikely, questions linger about what to do with two self-proclaimed separatist republics in the Donbass when the fighting is truly over. Some Ukrainians living outside the Donbass are inclined to forfeit the contested territories and the populations there. They are distrustful and fed up with the residents, whom many consider brainwashed by Russian propaganda and incapable of reintegrating into mainstream Ukrainian society. However, some Ukrainian soldiers and combat veterans push back against the idea of abandoning the Donbass. They paid too high a price, they say, to support surrender, no matter how pragmatic the move might be economically or politically. So Ukrainian politicians as well as veterans quietly worry that if Kiev were to simply relinquish control or cave to Russian demands regarding the separatist territories, it could spark civil unrest by soldiers and veterans who feel betrayed. Violent protests in Kiev in August against a parliamentary vote granting a measure of autonomy to the separatist territories highlighted how Ukrainian politicians are caught in a tricky balancing act. They weigh the opportunity costs of continuing the war against the resolute patriotism of a generation of combat veterans who have stared down Russian tanks and artillery since March 2014. When the Christmas lights and Santa caps are put away across Ukraine, soldiers still will be on the front lines. The battle to root out corruption will lie ahead. Ukraine’s holiday respite will be over.